Citation Information: JCI Insight. 2016;1(11):e85560. https://doi.org/10.1172/jci.insight.85560. Citation Information: JCI Insight. 2016;1(11):e86182. https://doi.org/10.1172/jci.insight.86182. BACKGROUND. Sorafenib is an oral antiangiogenic agent administered in advanced-stage hepatocellular carcinoma (HCC). Based on preclinical and human studies, we hypothesized that, in addition to its antiangiogenic properties, sorafenib may beneficially reduce the extent of the immunosuppressive network in HCC patients. To test this hypothesis, we examined whether alterations in the immunosuppressive burden of advanced-stage HCC patients correlated with clinical outcome. METHODS. In before and after sorafenib treatment, blood samples collected from 19 patients with advanced HCC, the frequency of PD-1+ T cells, Tregs, and myeloid derived suppressor cells (MDSC) were quantified by multiparameter FACS. Cytokine levels in plasma were determined by ELISA. RESULTS. Overall survival (OS) was significantly impacted by the reduction in the absolute number of both CD4+PD-1+ T cells and CD8+PD-1+ T cells following sorafenib treatment. Significant decreases in the frequency and absolute number of Foxp3+ Tregs were also observed, and a statistically significant improvement in OS was noted in patients exhibiting a greater decrease in the number of Foxp3+ Tregs. The ratio of CD4+CD127+PD-1– T effector cells to CD4+Foxp3+PD-1+ Tregs was significantly increased following treatment with sorafenib. Increased frequency of CD4+CD127+ T effector cells in the posttreatment samples significantly correlated with OS. CONCLUSION. This study is the first to our knowledge to demonstrate the potent immunomodulatory effects of sorafenib therapy on PD-1+ T cells and Tregs and the ensuing correlation with survival. These phenotypes could serve as predictive biomarkers to identify HCC patients who are likely to benefit from sorafenib treatment. FUNDING. This study was supported by NCI Core Grant to RPCI (NIH P30 CA016056) and discretionary funds to Y. Thanavala. Citation Information: JCI Insight. 2016;1(11):e86548. https://doi.org/10.1172/jci.insight.86548. The deubiquitinase-encoding gene Cyld displays a dominant genetic linkage to a wide spectrum of skin-appendage tumors, which could be collectively designated as CYLD mutant–syndrome (CYLDm-syndrome). Despite recent advances, little is understood about the molecular mechanisms responsible for this painful and difficult-to-treat skin disease. Here, we generated a conditional mouse model with epidermis-targeted expression of a catalytically deficient CYLDm through K14-Cre–mediated deletion of exon 9 (hereafter refer to CyldEΔ9/Δ9). CyldEΔ9/Δ9 mice were born alive but developed hair and sebaceous gland abnormalities and dental defects at 100% and 60% penetrance, respectively. Upon topical challenge with DMBA/TPA, these animals primarily developed sebaceous and basaloid tumors resembling human CYLDm-syndrome as opposed to papilloma, which is most commonly induced in WT mice by this treatment. Molecular analysis revealed that TRAF6-K63-Ubiquitination (K63-Ub), c-Myc-K63-Ub, and phospho-c–Myc (S62) were markedly elevated in CyldEΔ9/Δ9 skin. Topical treatment with a pharmacological c-Myc inhibitor induced sebaceous and basal cell apoptosis in CyldEΔ9/Δ9 skin. Consistently, c-Myc activation was readily detected in human cylindroma and sebaceous adenoma. Taken together, our findings demonstrate that CyldEΔ9/Δ9 mice represent a disease-relevant animal model and identify TRAF6 and c-Myc as potential therapeutic targets for CYLDm-syndrome. Citation Information: JCI Insight. 2016;1(11):e86663. https://doi.org/10.1172/jci.insight.86663. Within the CNS, a dysregulated hemostatic response contributes to both hemorrhagic and ischemic strokes. Tissue factor (TF), the primary initiator of the extrinsic coagulation cascade, plays an essential role in hemostasis and also contributes to thrombosis. Using both genetic and pharmacologic approaches, we characterized the contribution of neuroectodermal (NE) cell TF to the pathophysiology of stroke. We used mice with various levels of TF expression and found that astrocyte TF activity reduced to ~5% of WT levels was still sufficient to maintain hemostasis after hemorrhagic stroke but was also low enough to attenuate inflammation, reduce damage to the blood-brain barrier, and improve outcomes following ischemic stroke. Pharmacologic inhibition of TF during the reperfusion phase of ischemic stroke attenuated neuronal damage, improved behavioral deficit, and prevented mortality of mice. Our data demonstrate that NE cell TF limits bleeding complications associated with the transition from ischemic to hemorrhagic stroke and also contributes to the reperfusion injury after ischemic stroke. The high level of TF expression in the CNS is likely the result of selective pressure to limit intracerebral hemorrhage (ICH) after traumatic brain injury but, in the modern era, poses the additional risk of increased ischemia-reperfusion injury after ischemic stroke. Citation Information: JCI Insight. 2016;1(11):e86821. https://doi.org/10.1172/jci.insight.86821. BACKGROUND. Enzyme replacement therapy (ERT) has prolonged survival and improved clinical outcomes in patients with infantile Pompe disease (IPD), a rapidly progressive neuromuscular disorder. Yet marked interindividual variability in response to ERT, primarily attributable to the development of antibodies to ERT, remains an ongoing challenge. Immune tolerance to ongoing ERT has yet to be described in the setting of an entrenched immune response. METHODS. Three infantile Pompe patients who developed high and sustained rhGAA IgG antibody titers (HSAT) and received a bortezomib-based immune tolerance induction (ITI) regimen were included in the study and were followed longitudinally to monitor the long-term safety and efficacy. A trial to taper the ITI protocol was attempted to monitor if true immune tolerance was achieved. RESULTS. Bortezomib-based ITI protocol was safely tolerated and led to a significant decline in rhGAA antibody titers with concomitant sustained clinical improvement. Two of the 3 IPD patients were successfully weaned off all ITI protocol medications and continue to maintain low/no antibody titers. ITI protocol was significantly tapered in the third IPD patient. B cell recovery was observed in all 3 IPD patients. CONCLUSION. This is the first report to our knowledge on successful induction of long-term immune tolerance in patients with IPD and HSAT refractory to agents such as cyclophosphamide, rituximab, and methotrexate, based on an approach using the proteasome inhibitor bortezomib. As immune responses limit the efficacy and cost-effectiveness of therapy for many conditions, proteasome inhibitors may have new therapeutic applications. FUNDING. This research was supported by a grant from the Genzyme Corporation, a Sanofi Company (Cambridge, Massachusetts, USA), and in part by the Lysosomal Disease Network, a part of NIH Rare Diseases Clinical Research Network (RDCRN). Citation Information: JCI Insight. 2016;1(11):e87168. https://doi.org/10.1172/jci.insight.87168. Significant morbidity in cystic fibrosis (CF) results from chronic lung inflammation, most commonly due to Pseudomonas aeruginosa infection. Recent data suggest that IL-17 contributes to pathological inflammation in the setting of abnormal mucosal immunity, and type 17 immunity–driven inflammatory responses may represent a target to block aberrant inflammation in CF. Indeed, transcriptomic analysis of the airway epithelium from CF patients undergoing clinical bronchoscopy revealed upregulation of IL-17 downstream signature genes, implicating a substantial contribution of IL-17–mediated immunity in CF lungs. Bromodomain and extraterminal domain (BET) chromatin modulators can regulate T cell responses, specifically Th17-mediated inflammation, by mechanisms that include bromodomain-dependent inhibition of acetylated histones at the IL17 locus. Here, we show that, in vitro, BET inhibition potently suppressed Th17 cell responses in explanted CF tissue and inhibited IL-17–driven chemokine production in human bronchial epithelial cells. In an acute P. aeruginosa lung infection murine model, BET inhibition decreased inflammation, without exacerbating infection, suggesting that BET inhibition may be a potential therapeutic target in patients with CF. Citation Information: JCI Insight. 2016;1(11):e87632. https://doi.org/10.1172/jci.insight.87632. Asthma is a chronic inflammatory airways disease that usually begins in early life and involves gene-environment interactions. Although most asthma exhibits allergic inflammation, many allergic individuals do not have asthma. Here, we report how the asthma gene a disintegrin and metalloprotease 33 (ADAM33) acts as local tissue susceptibility gene that promotes allergic asthma. We show that enzymatically active soluble ADAM33 (sADAM33) is increased in asthmatic airways and plays a role in airway remodeling, independent of inflammation. Furthermore, remodeling and inflammation are both suppressed in Adam33-null mice after allergen challenge. When induced in utero or added ex vivo, sADAM33 causes structural remodeling of the airways, which enhances postnatal airway eosinophilia and bronchial hyperresponsiveness following subthreshold challenge with an aeroallergen. This substantial gene-environment interaction helps to explain the end-organ expression of allergic asthma in genetically susceptible individuals. Finally, we show that sADAM33-induced airway remodeling is reversible, highlighting the therapeutic potential of targeting ADAM33 in asthma. Citation Information: JCI Insight. 2016;1(11):e87680. https://doi.org/10.1172/jci.insight.87680. Acute kidney injury (AKI) is a common clinical condition defined as a rapid decline in kidney function. AKI is a global health burden, estimated to cause 2 million deaths annually worldwide. Unlike AKI in the young, which is reversible, AKI in the elderly often leads to end-stage renal disease, and the mechanism that prevents kidney repair in the elderly is unclear. Here we demonstrate that aged but not young mice developed multiple tertiary lymphoid tissues (TLTs) in the kidney after AKI. TLT size was associated with impaired renal function and increased expression of proinflammatory cytokines and homeostatic chemokines, indicating a possible contribution of TLTs to sustained inflammation after injury. Notably, resident fibroblasts from a single lineage diversified into p75 neurotrophin receptor+ (p75NTR+) fibroblasts and homeostatic chemokine–producing fibroblasts inside TLTs, and retinoic acid–producing fibroblasts around TLTs. Deletion of CD4+ cells as well as late administration of dexamethasone abolished TLTs and improved renal outcomes. Importantly, aged but not young human kidneys also formed TLTs that had cellular and molecular components similar to those of mouse TLTs. Therefore, the inhibition of TLT formation may offer a novel therapeutic strategy for AKI in the elderly. Citation Information: JCI Insight. 2016;1(11):e87908. 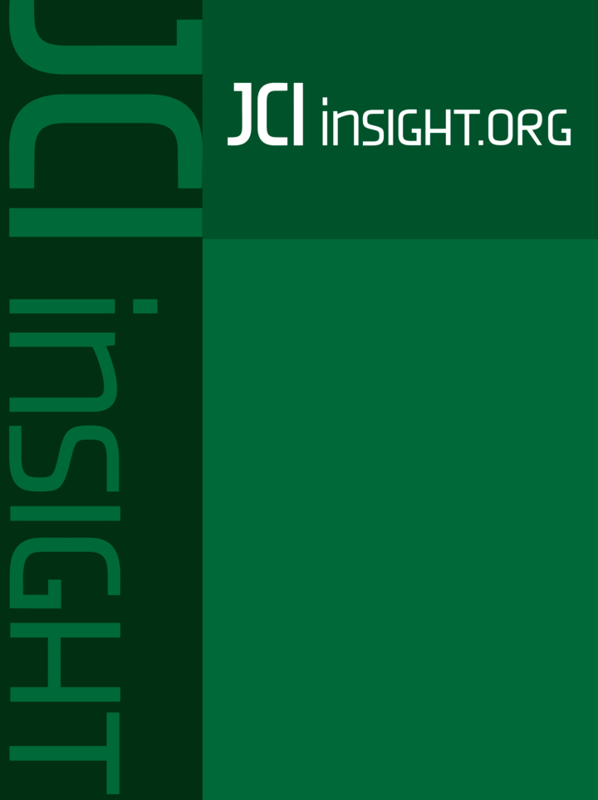 https://doi.org/10.1172/jci.insight.87908. The autosomal recessive neuromuscular disease spinal muscular atrophy (SMA) is caused by loss of survival motor neuron (SMN) protein. Molecular pathways that are disrupted downstream of SMN therefore represent potentially attractive therapeutic targets for SMA. Here, we demonstrate that therapeutic targeting of ubiquitin pathways disrupted as a consequence of SMN depletion, by increasing levels of one key ubiquitination enzyme (ubiquitin-like modifier activating enzyme 1 [UBA1]), represents a viable approach for treating SMA. Loss of UBA1 was a conserved response across mouse and zebrafish models of SMA as well as in patient induced pluripotent stem cell–derive motor neurons. Restoration of UBA1 was sufficient to rescue motor axon pathology and restore motor performance in SMA zebrafish. Adeno-associated virus serotype 9–UBA1 (AAV9-UBA1) gene therapy delivered systemic increases in UBA1 protein levels that were well tolerated over a prolonged period in healthy control mice. Systemic restoration of UBA1 in SMA mice ameliorated weight loss, increased survival and motor performance, and improved neuromuscular and organ pathology. AAV9-UBA1 therapy was also sufficient to reverse the widespread molecular perturbations in ubiquitin homeostasis that occur during SMA. We conclude that UBA1 represents a safe and effective therapeutic target for the treatment of both neuromuscular and systemic aspects of SMA. Citation Information: JCI Insight. 2016;1(11):e88409. https://doi.org/10.1172/jci.insight.88409. Urine concentration is regulated by vasopressin. Congenital nephrogenic diabetes insipidus (NDI) is caused by vasopressin type 2 receptor (V2R) mutations. We studied whether metformin could improve urine concentration in rodent models of congenital NDI by stimulating AMPK. To block the V2R in rats, tolvaptan (10 mg/kg/d) was given by oral gavage with or without metformin (800 mg/kg/d). Control rats received vehicle with or without metformin. Tamoxifen-induced V2R KO mice were given metformin (600 mg/kg) or vehicle twice daily. Urine osmolality in tolvaptan-treated rats (1,303 ± 126 mOsM) was restored to control levels by metformin (2,335 ± 273 mOsM) within 3 days and was sustained for up to 10 days. Metformin increased protein abundance of inner medullary urea transporter UT-A1 by 61% and aquaporin 2 (AQP2) by 44% in tolvaptan-treated rats, and immunohistochemistry showed increased membrane accumulation of AQP2 with acute and chronic AMPK stimulation. Outer medullary Na+-K+-2Cl– cotransporter 2 (NKCC2) abundance increased (117%) with AMPK stimulation in control rats but not in V2R-blocked rats. Metformin increased V2R KO mouse urine osmolality within 3 hours, and the increase persisted for up to 12 hours. Metformin increased AQP2 in the V2R KO mice similar to the tolvaptan-treated rats. These results indicate that AMPK activators, such as metformin, might provide a promising treatment for congenital NDI. Citation Information: JCI Insight. 2016;1(11):e88544. https://doi.org/10.1172/jci.insight.88544. Low-grade chronic inflammation is a key etiological phenomenon responsible for the initiation and perpetuation of obesity and diabetes. Novel therapeutic approaches that can specifically target inflammatory pathways are needed to avert this looming epidemic of metabolic disorders. Genetic and chemical inhibition of SH2-containing inositol 5′ phosphatase 1 (SHIP1) has been associated with systemic expansion of immunoregulatory cells that promote a lean-body state; however, SHIP1 function in immunometabolism has never been assessed. This led us to investigate the role of SHIP1 in metabolic disorders during excess caloric intake in mice. Using a small-molecule inhibitor of SHIP1 (SHIPi), here we show that SHIPi treatment in mice significantly reduces body weight and fat content, improves control of blood glucose and insulin sensitivity, and increases energy expenditure, despite continued consumption of a high-fat diet. Additionally, SHIPi reduces age-associated fat in mice. We found that SHIPi treatment reverses diet-associated obesity by attenuating inflammation in the visceral adipose tissue (VAT). SHIPi treatment increases IL-4–producing eosinophils in VAT and consequently increases both alternatively activated macrophages and myeloid-derived suppressor cells. In addition, SHIPi decreases the number of IFN-γ–producing T cells and NK cells in VAT. Thus, SHIPi represents an approach that permits control of obesity and diet-induced metabolic syndrome without apparent toxicity. Citation Information: JCI Insight. 2016;1(11):e87336. https://doi.org/10.1172/jci.insight.87336. Liver fibrosis, a consequence of chronic liver injury and a way station to cirrhosis and hepatocellular carcinoma, lacks effective treatment. Endocannabinoids acting via cannabinoid-1 receptors (CB1R) induce profibrotic gene expression and promote pathologies that predispose to liver fibrosis. CB1R antagonists produce opposite effects, but their therapeutic development was halted due to neuropsychiatric side effects. Inducible nitric oxide synthase (iNOS) also promotes liver fibrosis and its underlying pathologies, but iNOS inhibitors tested to date showed limited therapeutic efficacy in inflammatory diseases. Here, we introduce a peripherally restricted, orally bioavailable CB1R antagonist, which accumulates in liver to release an iNOS inhibitory leaving group. In mouse models of fibrosis induced by CCl4 or bile duct ligation, the hybrid CB1R/iNOS antagonist surpassed the antifibrotic efficacy of the CB1R antagonist rimonabant or the iNOS inhibitor 1400W, without inducing anxiety-like behaviors or CB1R occupancy in the CNS. The hybrid inhibitor also targeted CB1R-independent, iNOS-mediated profibrotic pathways, including increased PDGF, Nlrp3/Asc3, and integrin αvβ6 signaling, as judged by its ability to inhibit these pathways in cnr1–/– but not in nos2–/– mice. Additionally, it was able to slow fibrosis progression and to attenuate established fibrosis. Thus, dual-target peripheral CB1R/iNOS antagonists have therapeutic potential in liver fibrosis. Citation Information: JCI Insight. 2016;1(11):e87850. https://doi.org/10.1172/jci.insight.87850. Constitutively active splice variants of androgen receptor (AR-Vs) lacking ligand-binding domain (LBD) are a mechanism of resistance to androgen receptor LBD–targeted (AR LBD–targeted) therapies for metastatic castration-resistant prostate cancer (CRPC). There is a strong unmet clinical need to identify prostate cancer patients with AR-V–positive lesions to determine whether they will benefit from further AR LBD–targeting therapies or should receive taxanes or investigational drugs like EPI-506 or galeterone. Both EPI-506 (NCT02606123) and galeterone (NCT02438007) are in clinical trials and are proposed to have efficacy against lesions that are positive for AR-Vs. AR activation function-1 (AF-1) is common to the N-terminal domains of full-length AR and AR-Vs. Here, we provide proof of concept for developing imaging compounds that directly bind AR AF-1 to detect both AR-Vs and full-length AR. 123I-EPI-002 had specific binding to AR AF-1, which enabled direct visualization of CRPC xenografts that express full-length AR and AR-Vs. Our findings highlight the potential of 123I-EPI-002 as an imaging agent for the detection of full-length AR and AR-Vs in CRPC.